The teaching of the masters, who revealed themselves as "the Far sighted Ones who can see forever." When I asked who they were, I was told "they are the Masters who have walked this way before you." Their message was delivered in topics; in lessons to encourage us to walk on their Rainbow Bridge at the same time as we walk on our Earth. It is their message for the new Age of Aquarius. This was given with pictures to illustrate their meaning which can be used for meditation and are in full colour. The book can also be used for divination and daily guidance. Just ask, and open it! "I am the Light that feeds and nourishes you. I am the earth beneath your feet. I am within all living things. 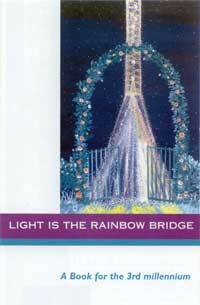 I AM THE RAINBOW BRIDGE."